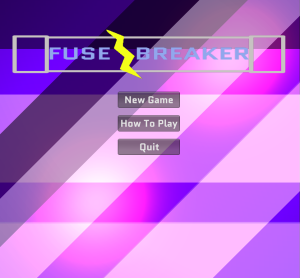 If you trot over to the current version of Fuse-Breaker, you’ll see that the menu is boring, bland, functional. This has a lot to do with the fact that I only had 48 hours to make the game, so the menus had to work (although in the end they didn’t) and that’s about it. Now that I have more time, however, I’ve put more work into making them look nicer. Inspired by the opening to the film Catch Me If You Can, I’ve played with the idea of light and shadow and constant motion. Obviously I can’t be as overt as Catch Me If You Can, because I need it to be a serviceable menu too. What I have is mostly the background layer of the scene, ignore the buttons, because they are just the default Unity style, I’ll be changing them later. I built the background by panning thin cubes in various locations and orientations over the screen. These cubes have light and dark translucent materials on them. This depicts a chaotic battle between light and dark. On top of this I will add silhouetted figures running around and stealing things, but for now I think this is a good start. It’s not resolution-independent, and this means that if you go for a wide-angle resolution like 1680×1050 you see a lot more of the moving cubes and the illusion is broken. This is something I aim to address soon in a more in-depth blog post. What do you think? Aside from the buttons and the logo (which sadly I think needs redoing), I’m happy with it, but design isn’t my forte. If you know better, I’d love to hear your thoughts. Submit any comments or criticisms in the comments section below. 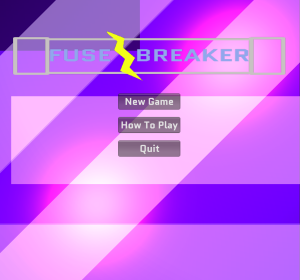 This entry was posted in Development Journal, Fuse-Breaker on July 25, 2013 by Nick.